This fun and reliable weekend driver was delivered to Houston, Texas where our client plans to use it for sprints around town and some light off-roading. 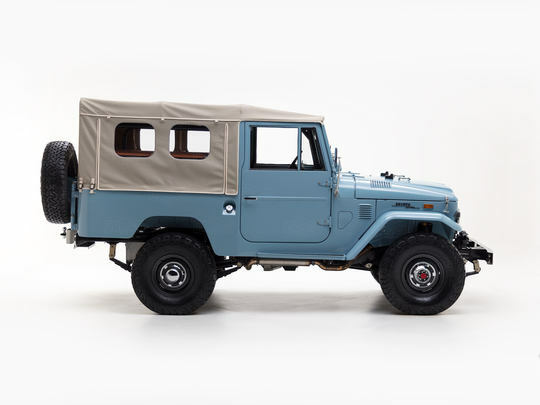 This FJ43's armor has been perfected and repainted in a breathtaking shade of Capri Blue (T310), while a number of off-road parts and accessories accentuate its rugged nature. LED lighting brings a wider range of visibility in all conditions, while a new set of BFGoodrich® All-Terrain tires stand ready to meet all that lies ahead. For improved on- and off-road performance, we upgraded the engine to an electronically-injected Toyota 1FZ engine and paired it with a 5-speed manual transmission. Power steering, Old Man Emu suspension, and front disc brakes provide optimal control and stopping power. The interior cabin of this FJ43 is fortified with tough materials and plenty of creature comforts. Saddle vinyl adds a vintage touch and complements the exposed metal dashboard with its retro knobs and digital cluster. Air conditioning keeps the cabin comfortable, while the vintage-style radio plays your favorite songs. The G40 Expedition brings the classic adventure into new territory with a Toyota 1GR-FE engine and other modern upgrades. Build yours today!